TestTrack’s Microsoft Word import process has been enhanced in TestTrack 2015.1 to include support for linked and embedded objects, such as Excel spreadsheets and PowerPoint presentations, for higher quality imports. When importing a requirement document from Word, any supported objects that are inserted in the source document are included as inline images in the imported requirements to closely resemble how they appear in Word. The objects are also attached to their corresponding requirements, which is automatically noted in the requirement description for easy reference. 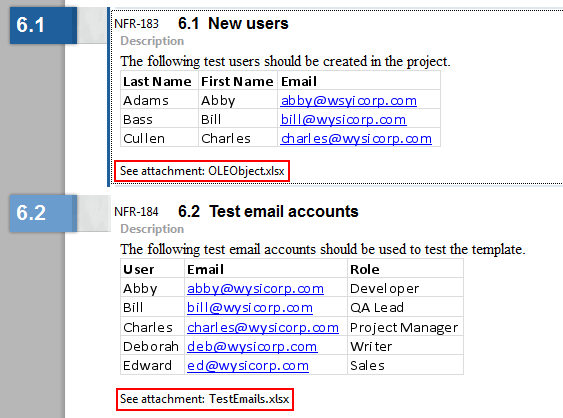 The object attachment name in TestTrack depends on if the object is embedded or linked to in the source Word document. Objects that are embedded and maintained in the Word document are imported as attachments named OLEObject. Objects that are linked to an external source in the Word document are imported with the linked source file attached. Note: If multiple objects of the same type are imported, or a linked object is included in multiple requirements, a number is appended to the attachment filename and incremented for each object (e.g., OLEObject.xlsx, OLEObject_1.xlsx, etc. or UserStatistics.xlsx, UserStatistics_1.xlsx, etc.). Illustrations and graphical text objects, including charts, shapes, text boxes, smart art, equations, clip art, word art, and drawing canvases, are also now imported as inline images in requirements; however, some of these objects may look slightly different in TestTrack. Before importing requirements from Word to TestTrack, check out our Tips for Importing Microsoft Word Requirement Documents into TestTrack for information about preparing your Word documents and TestTrack for the best import results.